Healthy rabbits have soft, sleek fur and clean, smooth skin, so any sign of skin problems, such as open sores, inflammation, dandruff or crustiness, is worrying. Skin problems are often accompanied by excessive fur loss and have a number of causes, including bacterial or fungal infections, parasites or internal disease, though sometimes a simple behavioral problem is to blame. Harmful bacteria and fungi can infect rabbit skin. Bacterial infections occur in moist environmental conditions and through breaks in skin, causing redness, crusting, matted fur and sometimes poor grooming. A suspected bacterial infection requires immediate vet attention, because the odor attracts flies that lay their eggs on diseased skin, which can be fatal and is certainly unpleasant for everyone. Fungal infections show up as round bald patches, sometimes with raised red spots but only slight irritation. These also require a trip to the vet's for the appropriate medication. Rabbits can suffer from fleas and mites. 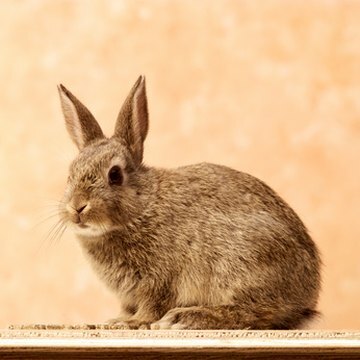 Intense itchiness can be the result of an infestation of these parasites, and skin damage and fur loss caused by your rabbit's intense scratching for relief. Mites are responsible for mange diseases, which cause rabbit skin to become raised, crusty and flaky, possibly giving off an unpleasant smell. Infestations often start in the eyes, ears, nose, mouth and toes. Fur mite infestations produce dandruff on the skin and fur loss. All parasite infestations require veterinary treatment. It's important not to use flea treatments intended for other animals, as these can be poisonous to rabbits. Sometimes internal problems requiring veterinary care show up on rabbit skin and fur. When rabbits drool due to dental problems, caustic saliva burns skin and causes fur to fall out. Affected areas are itchy and sore, so rabbits sometimes chew on them, making the problem worse. Signs of dental problems show up around the mouth and chin area and in the dewlaps beneath the chin. Leaking urine burns rabbit skin too. Redness, sore skin and fur loss only on the belly, inner hind legs, tail or feet could be signs of a urinary tract problem. It's normal for all rabbits to shed fur, but sometimes rabbits shed lots all at once, leaving small bald patches. Patches that don't regrow within a few days could be a sign of disease, or possibly of a behavioral problem. Female rabbits undergoing a real or false pregnancy pull tufts of fur from their bodies to build a nest, and rabbits living together sometimes fight or over-groom each other, removing fur in the process.